Are you at risk for fractures? As bone weakness progresses, the bones in the spine collapse which can result in pain, reduced height and kyphosis, a severe curvature of the upper spine. Extreme cases of kyphosis can impede breathing. Most falls occur in the home, but there are things you can do to avoid them. Clear clutter off the floor. Tack down carpets firmly and secure loose wires along the walls. Keep items you often use within reach. Don’t use step stools. Use brighter light bulbs, especially along stairs. Wear shoes with non-slip soles. Review your medications with your doctor, especially if they make you sleepy or dizzy. Hip fractures from osteoporosis can be fatal or result in long-term disability. A bone density test of the spine and hip can determine if you have or are at risk for osteoporosis. The DXA test, a non-invasive low dose x-ray, is the most widely used measure of bone density. Should you get tested? Click here to find out. Did you break a bone after the age of 50? Did your mother have osteoporosis? Did you go through menopause before the age of 45? Do you typically have more than two alcoholic drinks a day? Do you get less than the recommended amounts of vitamin D and calcium every day? Are you taking certain drugs, such as prescription steroids and antiepileptic medications? talk to your doctor about a possible risk for osteoporosis. To estimate your risk, click here. As side effects go, this one flew below the radar. Hope White, 45, knew she needed strong doses of steroids to wage her battle against a particularly virulent case of lupus. But she didn’t give much thought to the fact that those treatments to combat her auto-immune disease would make her susceptible to weakened bones. In fact, when her doctor suggested that she — a young black woman — could acquire osteoporosis — a condition that hits mostly aging, white women — she was almost amused. Fortunately, her doctor insisted and ordered the first of three bone tests. Sure enough, White was diagnosed with osteoporosis. Like most people, White didn’t pay much attention to the health of her bones. Fortunately, the Surgeon General did and in 2004 delivered a sobering report that more than 10 million people across the country had osteoporosis and another 34 million were at risk. And the costs were — and remain — significant. Treatment for fractures resulting from osteoporosis amounts to about $18 billion a year, and fractures are just the beginning of the medical problems. Twenty percent of older people who sustain osteoporosis-related hip fractures die within a year, and those who survive can experience a downward spiral in their health. Most at risk are thin, older white and Asian women, but men and black women are not exempt. Although more prevalent in people over the age of 50, osteoporosis can strike at any age. The disease also tends to run in families. Osteoporosis, or porous bones, is characterized by a decrease in bone density that leaves those affected more vulnerable to life-threatening fractures. Bone density refers to the amount of calcium, other minerals and protein packed in bone. 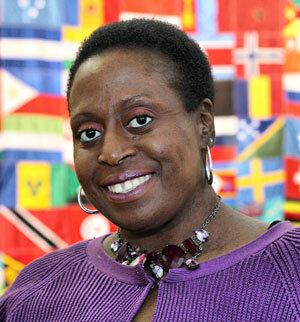 According to Dr. Sherri-Ann M. Burnett-Bowie, an endocrinologist at Massachusetts General Hospital, on average, black women have a higher bone density than white women, but that does not offer complete immunity. The National Osteoporosis Foundation (NOF) has determined that 5 percent of black women aged 50 and older as compared to 20 percent of white and Asian women aged 50 and older are estimated to have osteoporosis. 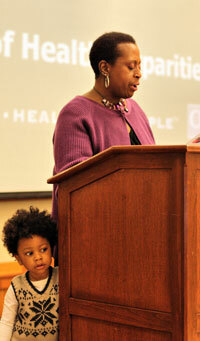 But Burnett-Bowie cautioned that some experts estimate the prevalence among black women is closer to 11 percent. The frequency in men is smaller — 4 percent and 7 percent in black and white men, respectively. The threat of osteoporosis is greater in blacks than expected, White learned, largely because of the long-term use of medications, such as steroids, to treat illnesses prevalent among African Americans. Asthma, arthritis, lupus and some cancers are examples of diseases where some of the treatments increase the risk of developing osteoporosis. Indeed, there’s not much amusing about osteoporosis at all. Studies have indicated that death rates following osteoporosis-related hip fractures are higher in blacks than in whites. Complications of pneumonia, blood clots and poor circulation take a hefty toll. Misperceptions are part of the problem. Because many blacks believe that osteoporosis is not a threat, they are not looking for it, and worse, some doctors aren’t looking for it either. In one study, doctors from the Johns Hopkins School of Medicine found that significantly fewer African American women were tested for osteoporosis than their white counterparts, a surprising statistic given that both groups evaluated shared similar risks. Another group of researchers found more bad news. Many blacks treated at Howard University Hospital were not tested for the disease — even in the presence of bone fractures commonly associated with osteoporosis. Bone is composed of collagen — a type of protein — and calcium, which combine to give bones strength and flexibility. Bones are far from lifeless matter, and in fact, are in constant change removing the old and developing the new. During childhood and teenage years, bone development exceeds the pace of bone removal, resulting in larger, heavier and denser tissue. This process continues until young adults reach peak bone mass when bones reach their maximum strength and density. Osteoporosis develops when bone removal occurs too quickly or bone replacement occurs too slowly. Developing strong bones in childhood is key. If a child or teen does not reach optimal bone mass, osteoporosis is more likely. Bone deterioration accelerates in women in the first few years following menopause. According to the NOF, women can lose up to 20 percent or more of their bone density during the first five years after menopause. There are generally no symptoms of osteoporosis. If the spine is affected, some might experience back pain. 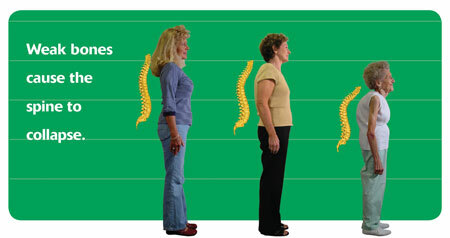 Others might experience only a decrease in height due to compression of the bones that comprise the spine. Extreme cases can result in spinal deformities, such as kyphosis, a severely stooped posture. More often than not, those suffering from the disease became aware of their problem when they experience what is aptly named a “fragility fracture.” They occur after a very mild trauma, such as an unexpected bump or a trip and fall from a low height. While bones in the wrist, hip or spine are usually impacted the most frequently, any bone can be affected. The gold standard detection for osteoporosis is the DXA test (dual energy X-ray absorptiometry), a low dosage X-ray that measures bone mineral density (BMD) in the spine and hip. The DXA can confirm a diagnosis of osteoporosis and detect those who are at risk. A common finding of the test is osteopenia, or reduced bone density — a precursor to osteoporosis. The NOF recommends a BMD for all women aged 65 or older and all men aged 70 or older as well as younger people with several risk factors for osteoporosis. Women who experience early menopause, for instance, are particularly vulnerable, as the loss of estrogen accelerates bone loss. 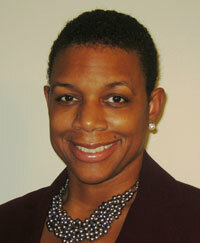 Sherri-Ann M. Burnett-Bowie, M.D., M.P.H. So important is a BMD that Medicare pays for it every two years. The good news is that bone loss can often be stopped and even reversed through a regimen of exercise and adequate amounts of calcium and vitamin D. More severe cases might require prescription drugs. “Anyone who has had a fragility fracture requires medication,” Burnett-Bowie said. “Because they are much more likely to have another fracture.” Additionally, if an individual has had a significant decrease in bone density on serial DXA tests, medical therapy may be prescribed. A web-based test to determine the likelihood of a fracture called FRAX — Fracture Risk Assessment Tool — was developed by the World Health Organization. Analysis of the results of the DXA test and risk factors will determine whether the probability of an osteoporosis-related fracture is significant enough to warrant medical therapy. Fortunately for White, her DXA indicated that she was at low risk for a fracture. White takes two kinds of calcium compounds — including one that contains vitamin D — three times a day after every meal. She pays more attention to her diet and consumes more calcium-rich foods, such as leafy greens and dairy products. She admits she was a bit inconsistent when it came to exercising, but now makes an effort to work out on the treadmill at her gym at least twice a week. Her calcium-rich diet and supplements have paid off. Subsequent tests indicated an improvement in her bone density. She is now considered to have osteopenia — not quite osteoporosis but still not in the normal range. White knows she still has a long way to go. And given her other medical conditions, steroid use will continue to be a factor in her life — for better and worse.